A New way to receive Trojan Thursday is here. Please help spread the word about Trojan Thursday. 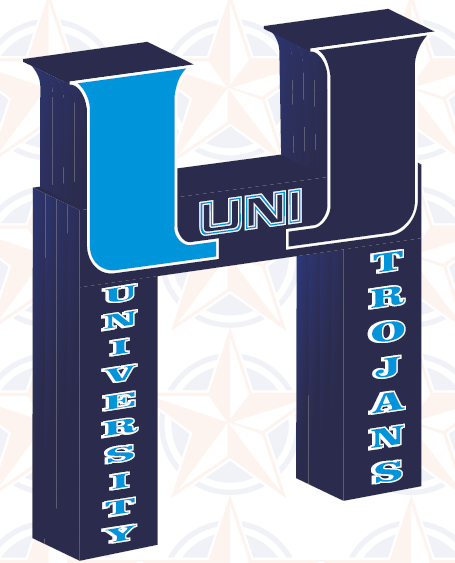 If you would like to receive Trojan Thursday each week please go to https://unitrojanthursday.wordpress.com. You will have to scroll all the way to the bottom of the page and type in your email address. You will then receive a notice each week when Trojan Thursday is posted. Boys Golf – Congratulations to our boys golf team for finishing in 5th place out of 20 teams at the CIF Team Divisional. Ari Gulugian was the low individual of the whole tournament with a 68 at Talega Golf Club in San Clemente. Our boys completed the season in 2nd place in the PCL. Our overall record was 13-5, 6-4 in league. Congrats on a great season golfers. 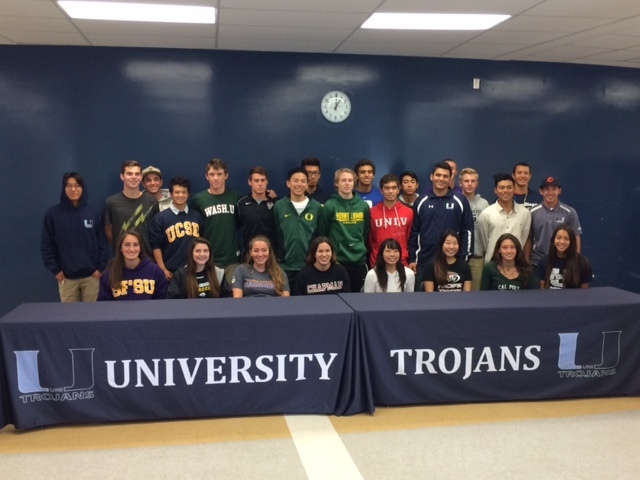 William Tse, sophomore, played in the CIF SS Individual Championship last week. The conditions at Mission Lakes in Desert Hot Springs were extreme. The wind was gusting up to 30mph. While he did not qualify for the next round we are extremely proud of his accomplishment of qualifying for individuals. Congratulations to Megan Kaufman who signed her National Letter of Intent last week. 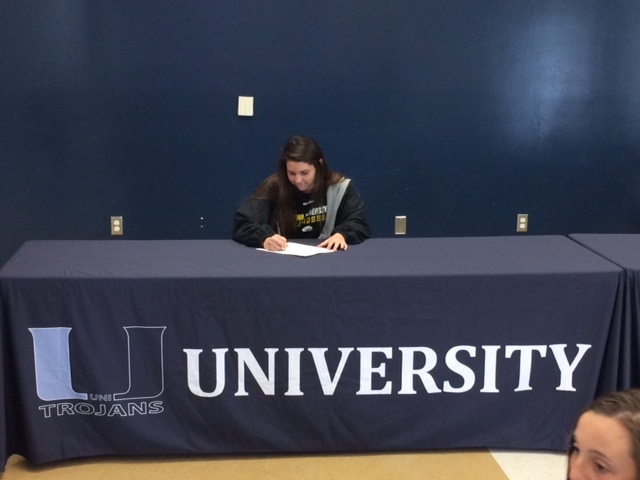 She signed to play Lacrosse at Ottawa University in Kansas. Good Luck next year Megan! Below is a picture of Megan signing her letter of intent. Congratulations to the following UNI Athletes who will continue their playing careers next year in college. Below is a picture of all of our UNI athletes who will be participating in college athletics. 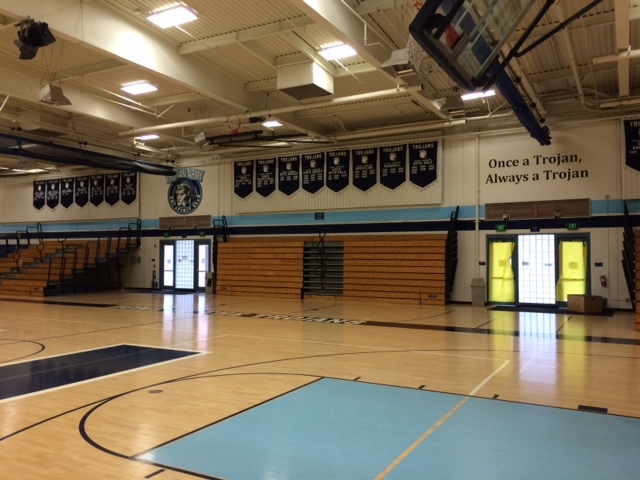 After a year and a half our gym project is finally over. The gym looks absolutely AMAZING! 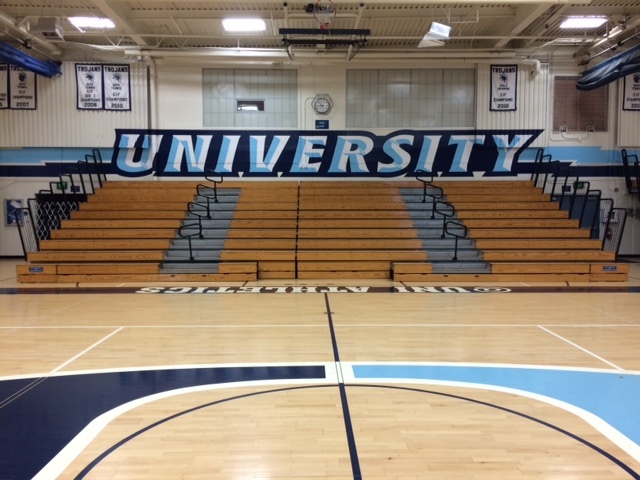 Take a look at a few pictures of our new paint job in the gym. 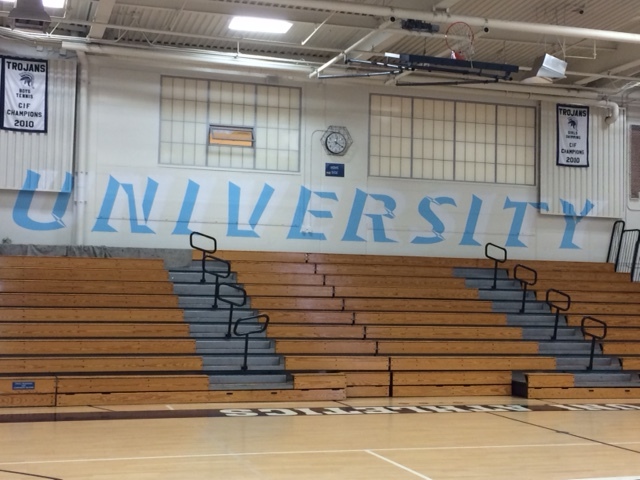 Make sure you stop by the gym to check out the new look. 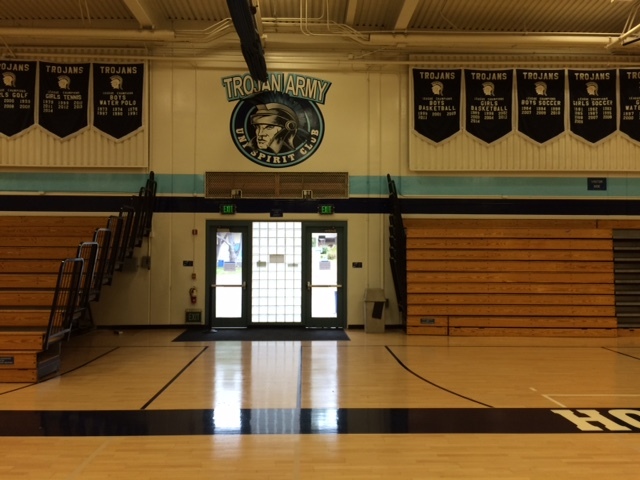 The Trojan Army would like to purchase a run through tunnel that will grab everyons attention. An example of the tunnel is below. We would once again be the first school in the league and area to have such a tunnel. 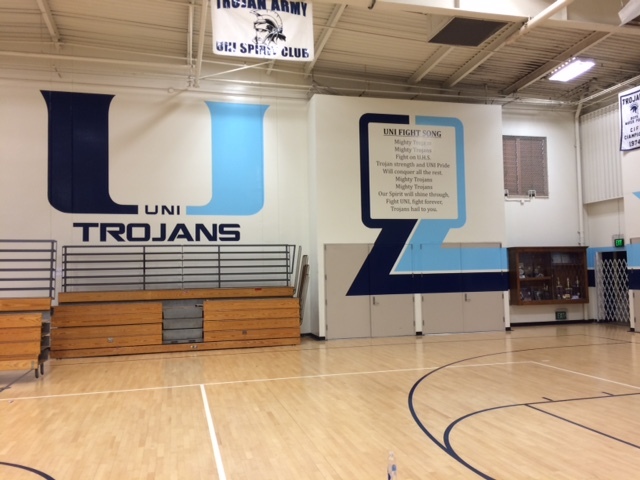 The Trojan Army has already raised a substantial amount of money for this project. We are close to being able to order this run through tunnel. Our plan is to use this tunnel at football games, pack the gym night, pep assemblies, Senior day games, and at any CIF Championsip walk. As of right now we are about $1000 dollars away from being able to purchase this tunnel. If you would like to make a donation to help offset the cost of this tunnel please send a check with your student to the Athletic office. If each athletic family gave $20 we would be able to order this tunnel right away. Donations can be turned into the athletic office or given to Coach McCaffrey. Checks shold be made out to UHS. Thank you UHS community for your support. This run through tunnel will once again give us the AHH factor that we have when we play other schools. Boys Golf – Congratulations to William Tse for qualifing for CIF infividuals. He will be playing at the CIF finals tomorrow. GOOD LUCK William!. Congratulations to Baeksun Kim, on being the first recipient of MaxlaxOC’s Stick With It award, given to a high school lacrosse player who has demonstrated an unwavering commitment to growing the game in Orange County, a commitment to his team, and a commitment to himself to be the best he can be on and off the field. A player that understands that true success is more than winning. To read the whole article on Baeksum and this award please use the following link. Boys Swim – CIF Champions! Congratulations to our boys swim team for winning the division 1 CIF Championship on Saturday night. The Trojan boys swim and dive team are the 2015 Division 1 Swimming and Diving Champions! For the second year in a row, the boys clinched the team title before the last relay. Trojans finished the dominating performance with 317 points, 2nd place Dana Hills 220 points and Loyola 219 points. The meet got off to a great start with Daniel Tran, Judd Howard, Andrew Knoell and Will Hofstadter getting first place in the 200 medley relay. Hofstadter did his best impression of Olympian, Jason Lezak to come from behind and anchor the winning freestyle leg of the relay. Hofstadter got 2nd in the 50 freestyle as well as the 100 freestyle. Daniel Tran was the CIF champion in the 200IM and 100 Backstroke. Daniel lowered his own school record in the 100 backstroke to 48.20. Ken Takahashi got 3rd in the 200IM and got 8th in the 500 freestyle. Judd Howard got 2nd in the 100 breaststroke and 6th in the 200IM. Judd lowered his own school record in the 100 breast by achieving his season long goal of breaking 55 seconds with a 54.98. Andrew Knoell made the championship finals in both 100 butterfly(6th) and 100 backstroke(8th). Alejandro Ortiz made it to finals in the 200 freestyle(16th) and 100 freestyle(15th). Matt Wong capped off his high school swim career with breaking 58 seconds in the 100 breast with a 57.98 to get 15th place. George Horvath got 7th place in the 500 freestyle with a 4:29.51, which is the 2nd fastest time in school history. Stephen Yang made the finals in the 100 Butterfly and got 18th. Chris Havton made the finals in the 100 breast and got 17th with a season best 58.66. 200 free relay with Ortiz, Wong, Takahashi and Hofstadter finished 4th. The 400 free relay(Knoell, Ortiz, Tran, Takahashi) lowered the school record from prelims to 3:05.12. It was a very special season for the Trojans Swim and Dive team. Below is the article that was in the OC Register about theswim championships. 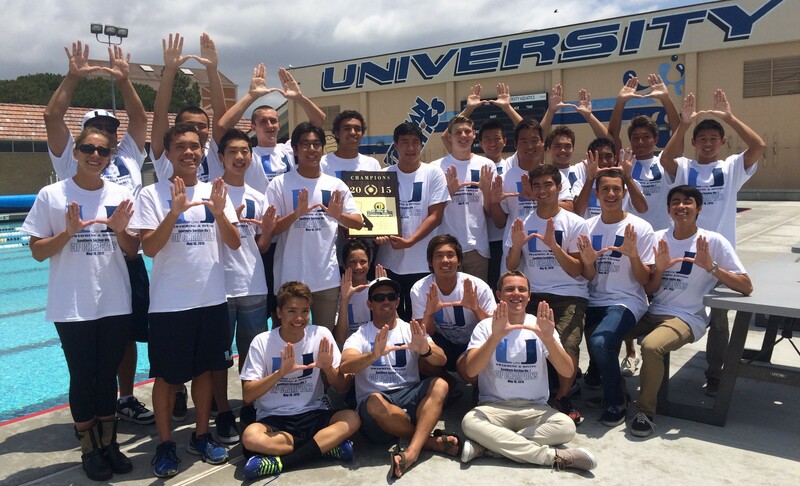 Division 1 finals recap -Expectations were soaring for University’s boys swimming team at CIF-SS Division 1 finals. Point projections based on a scoring of prelims established the Pacific Coast League champions as the heavy favorite to capture a second straight title. There also were internal expectations. “There was a huge expectation from the seniors from last year that we would uphold the tradition to win,” said Daniel Tran, one of eight key seniors for University. But just like in 2014, University met the expectations and then some, capturing the Division 1 crown by almost 100 points at Riverside City College on Saturday night. The Trojans scored 317 points to outdistance runner-up Dana Hills (220) and rival Loyola of Los Angeles (220), which was hurt by a disqualification in the 200-yard freestyle relay. “I think they’ll be happy,” Tran said of last year’s seniors. University followed a familiar formula. The Trojans employed a deep and well-balanced CIF roster that produced points with first-place touches along with depth across most events. The Harvard-bound Tran paced University by capturing the 200 individual medley (1 minute, 47.16 seconds) and 100 backstroke (lifetime-best 48.20) in two of the fastest times in county history. Tran’s IM ranks him third in county history while his school-record backstroke places him fourth. University’s title run was again sparked by a victory in the 200 medley. Tran teamed with senior Judd Howard, sophomore Andrew Knoell and senior Will Hofstadter to clock a 1:30.40, just three-tenths of a second off the Trojans’ Division 1 and county record of 1:30.10 from last season. The Trojans led at the midpoint but were rallied by a sizzling 19.94 anchor split by the Northwestern-bound Hofstadter. Hofstadter later finished second in the 50 free (20.82) and 100 free (45.18). Howard also placed second in the 100 breaststroke, blazing a school-record 54.98 that ranks him fourth in county history. The Trojans’ title sprint also featured a third-place by senior Ken Takahashi in the 200 IM (1:48.50), a sixth from Knoell in the butterfly (49.96), two B finishes by senior Alejandro Ortiz, B final points from senior breaststrokers Matt Wong and Christopher Havton and a seventh in the 500 free by George Horvath. “We wanted to go out with a bang and do as much as we could and I think we accomplished that,” Howard said. University sealed their title in the 400 free relay as Knoell, Ortiz, Tran and Takahashi finished sixth in a school-record 3:05.12. University’s title celebration included swimmer Aidan Yong, who is recovering after being hospitalized with a bacteria infection in his brain. Yong celebrated in the water with his teammates, including his brother, senior Matt Yong. “It was a lot of hard work throughout the season that really led to this,” Hofstadter said. Senior Lauren Weins finished 12th in the 100 backstroke with a season best time of 57.62. She also swam the 100 fly at prelims. Princess Ferguson-Nguyen finished 20th in the 50 freestyle and 27th in the 200 freestyle. Joyce Yang finished 19th in the 100 breast with a season best time of 1:07.66. The 200 Medley Relay team of Weins, Joyce Yang, Kathy Lim and Princess Ferguson-Nguyen finished 11th with a season best time of 1:48.37 and will be representing Uni at the first ever California State Meet in Fresno this coming weekend. The 200 Freestyle relay team finished 14th, just off their best time by .08 seconds. The 400 Freestyle relay team of Claire Jang, Anne Jang, Alondra Ortiz and Bella Khamseh finished in 30th place. Our boys won their second round CIF match v Westlake by a final of 10-8 last Saturday. Our doubles team swept all 9 points and Konrad Kozlowski picked up a point on the singles side. On Monday our boys ran into an excellent San Marino team in the quarterfinals and fell by a final of 12-6. This concludes another fabulous season for our tennis boys. Our boys finished with an overall record of 17-3 and a perfect 10-0 in league. Congratulations on a great season boys. 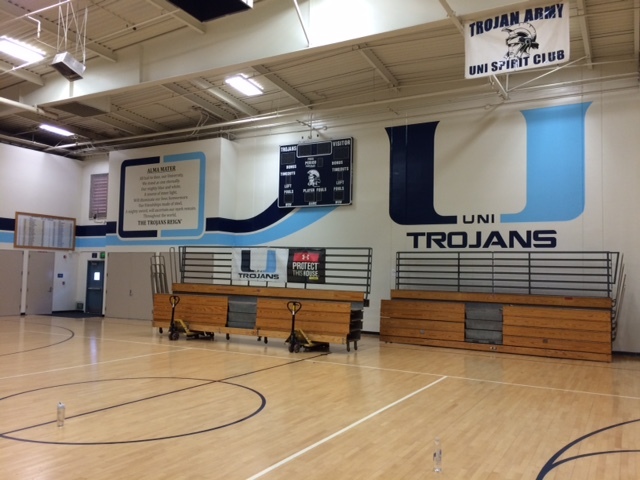 GYM PAINTING – Our gym is shut down all week as we are painting the UNI logos on the walls. Below is a sneak peak on what has been accomplished so far. 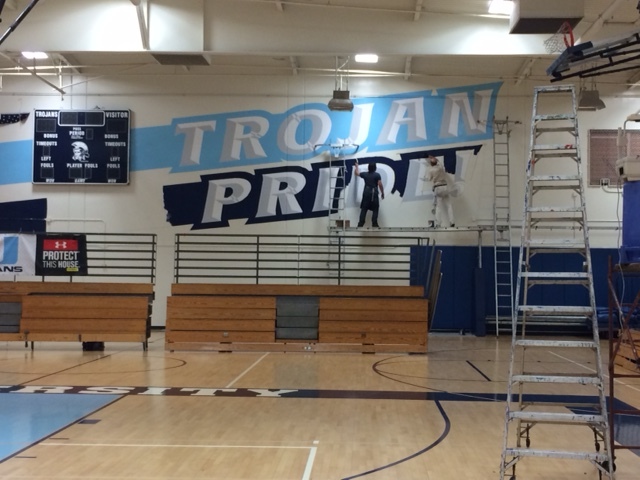 The gym is going to look amazing when we are finished. Baseball –On Tuesday, Freshmen Troy Lombardo won his first Varsity Game as the Trojans beat Irvine 3-2. Sophomore Jacob Collins and Freshmen Andy Masotto were the hitting stars with 2 hits apiece. Eric Brunst got his 3rd save of the year. Our boys will finish their season this afternoon and look for a three game sweep of Irvine. Good Luck Boys. Softball – Uni Softball came out to a record start against CMD last Thursday in their GOW and Senior Day game scoring 11 runs in the first inning! The girls batted around with monster hits from Zoe Manjarrez, Michela Boarnet and later a homerun from Janette Oh. Mia Maher continued her torrid stealing streak with 6 stolen bases to bring her season total to 41! Andrea Esparza, Anna Hawkins and Aubrey Maher all collected hits. Great catches in the outfield by Andrea Esparza and Kim Nguyen. It was an exciting 15-10 finish. Veggie Grill – The softball program is having a fundraiser next Thursday at the veggie Grill at UCI from 5 to 9 PM. They are giving us 50% back of all proceeds from our group. Congratulations to the Boys Varsity swim team on becoming the 2015 Pacific Coast League champions! The team was led by the outstanding Senior class of Chris Havton, Will Hofstadter, Alejandro Ortiz, Matt Wong, Matt Yong, Judd Howard, Daniel Tran and Ken Takahashi. Pacific League meet records fell and one school record got broken. Ken Takahashi broke the school record and meet record in the 200 freestyle. The 200 medley relay meet record was broken by Daniel Tran, Judd Howard, Andrew Knoell and Will Hofstadter, which is also the top-seeded time going into CIF this week. Daniel Tran was league champion in the 200IM and 100 Backstroke. Daniel broke his own meet record from last year in the 100 back. Will Hofstadter broke the meet record in the 100 freestyle and also won the 50 freestyle in a super fast 20.85. Will is seeded 2nd in the 50 and 100 freestyle for CIF this week. George Horvath and Ken Takahashi got 1st and 2nd place in the 500 freestyle. Alex Havton broke the JV meet record in the 100 breast. That record should stand for a long time. The 400 freestyle relay with Ken Takahashi, Alejandro Ortiz, Daniel Tran and Andrew Knoell got 1st place. Rising star and sophomore, Daniel Campanaro stepped up big at the finals got his CIF consideration cut in a personal best 22.23. Other notable performances were Matt Yong going a 1:55 in the 200IM, Judd Howard getting 2nd in the 100 breast with a 56.88, Stephen Yang getting a CIF cut in the 100 yard butterfly, Kei Yoshikawa throwing down some fast splits in the relays, and Matt Yong stepping up big in the 100 free and 100 breast to help score some big points for the team. Freshmen diver, Jonathan Aizik was the PCL league’s top diver last Thursday. The boys head into CIF with lots of momentum and are looking to repeat as CIF champions again this year. GO TROJANS!!! Aidan Strong – Aidan Yong, one of our boys swimmers was admitted to CHOC hospital the morning of May 4th. Later that evening the doctors diagnosed Aidan with mycoplasma encephalitis(infection of the brain), a rare disease. Aidan was released from the hospital a week later after making great improvement throughout the week. The doctors initially thought he would be in the hospital 3 weeks. With all the support from his family and friends that went to visit him in the hospital along with the thoughts and prayers from everyone helped a lot. Aidan is now home trying to build up his strength with physical therapy and trying to build back up his appetite. Aidan is expected to make a full recovery. Help show your support of Aidans recovery by joining the facebook page called Aidan Strong. We wish you a speedy recovery Aidan. At the PCL Finals last Friday, the Varsity girls finished 4th with some outstanding performances. The 200 Medley Relay team of Lauren Weins, Joyce Yang, Kathy Lim and Princess Ferguson-Nguyen dropped 2 seconds from their best time to finish 4th. This CIF consideration time did qualify the relay for the CIF meet this week. In the 200 freestyle, Lim had her best time this season, dropping 5 seconds from her seed time to finish 8th. In the 200 IM , all 4 Uni girls who qualified for finals had best times, finishing 6th (Yang), 7th (Celine Nie),11th ( Elysia Ouyang) and 12th (Claire Jang). In the 50 freestyle, all 3 girls swimming in finals had best times, with Ferguson-Nguyen leading the group moving up from 6th place in prelims to 2nd in finals. Nie finished 8th and Bella Khamseh finished 11th. In the 100 fly, again there were multiple best times, with Uni swimmers finishing 5th ( Weins),6th (Lim) 7th (A. Jang)and 10th (Alondra Ortiz). In the 100 free, Ferguson- Nguyen again had a significant time drop finishing 3rd and making her CIF consideration cut. Khamseh was 15th. Kamilla Szabdos finished 14th in the 500 free. The 200 free relay team of Ferguson-Nguyen, Lim, A. Jang and Nie dropped three seconds leaving them only 0.6 off the CIF automatic cut time, finishing second in the meet. In the 100 backstroke, Weins finished 3rd, A. Jang, 6th and Alondra Ortiz ,11th. In the 100 breaststroke, Yang finished 7th with a season best time, Ouyang was 10th, C. Jang 14th adn Szabdos 16th. In the final 400 free relay the team of Bella Khamseh, the Jang sisters and Nie finished 5th with a 3 second time drop. Today, the following swimmers will be competing at the CIF SS Division I Prelims at Riverside Community College: Princess Ferguson- Nguyen in the 50 and 100 freestyle, Lauren Weins in the 100 fly and the 100 backstroke, Anne Jang in the 100 backstroke, and Joyce Yang in the 100 breaststroke. Yang is an alternate in the 200 IM and Kathy Lim is an alternate in the 100 fly. Uni will field teams in all three relay events. In addition to those athletes swimming individual events, swimmers in the relays include Bella Khamseh, Elysia Ouyang, Celine Nie and Alondra Ortiz. Boys Tennis – PCL CHAMPIONS! Konrad Kozlowski won the PCL tennis single’s tournament and was also named league MVP. Josh Piatos, Rohan Lageweg, Tommy Wang, JT Joens, Ardi Safi and Riku Hashiyada were also named to the PCL first team for boys’ tennis. Our boys won their first round CIF match yesterday v Marina and will play tomorrow in the second round of the playoffs v Westlake here at UNI. Good Luck Boys! Boys Track – Boys Track finished up their season here at Uni last Friday night. On the Varsity side Zane Law finished 4th overall in the 800 and Julian Ricci was the league Champion in the Triple Jump followed by Vedavit Shetty. Julian Ricci will be moving on to CIF this Saturday at Trabuco Hills High School. Go Trojan Track and Field! Girls Track – Last Friday and Saturday our girls track team put on an amazing performance at league finals. As a result of their efforts our girls varsity finished 2nd overall in league! We are very proud of these girls and how they represented UNI. 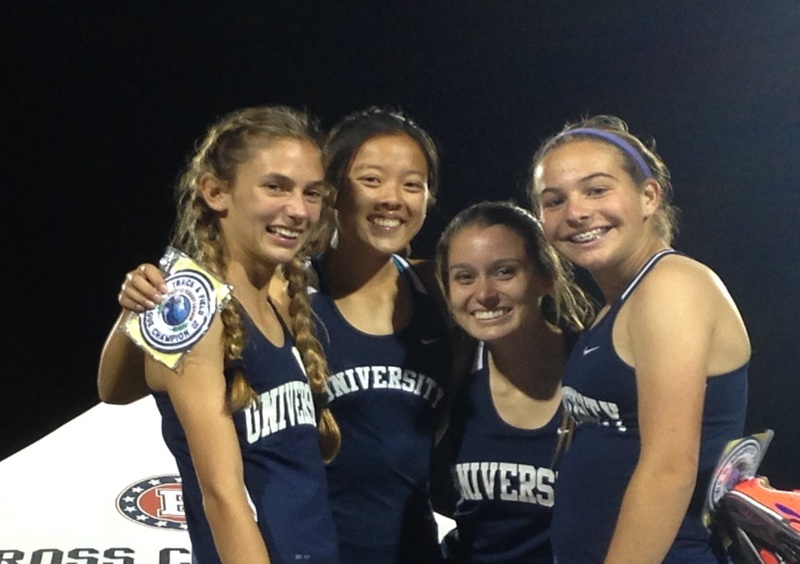 Below is a picture of our league champions in the 4 X 400 (Paige Metayer, Carmel Lee, Caroline Werth, Sarah Stern). Along with these 4 ladies, Melissa Lee (shot and discus) qualified for CIF this Saturday. On another exciting note, Paige Metayer finished 1st in the 400 and 800, putting herself in the running for league finals MVP! Please congratulate these girls and wish them luck at CIF! Go Trojans! 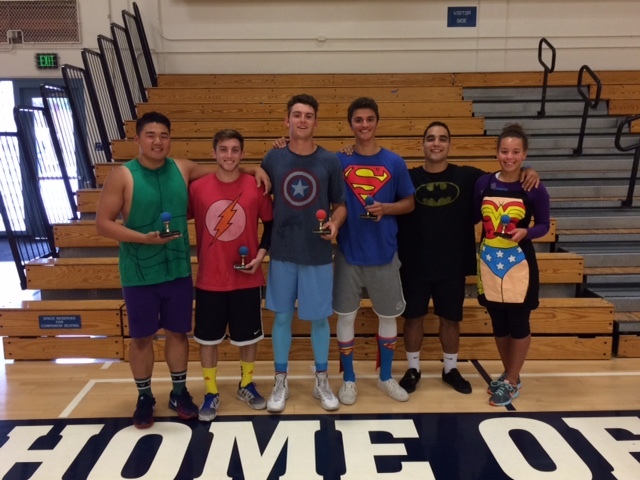 DODGEBALL – Congratulations to Team Domo for winning the UNI Dodgeball Tournament. Team Domo also beat Team Teacher. I hope everyone had a great time watching and playing in the UNI Dodge Ball Tournament. Baseball – Last Friday the Baseball Team defeated #2 Corona Del Mar 4-2. Junior Neil Boudreau pitched a 5 hit complete game. Sophomore Jacob Collins had the key hit for the Trojans. On Tuesday, Senior Eric Brunst threw a great game but ended up with a tough loss to Northwood 4-1. Freshmen Andy Masotto and Junior Ishiah Francis and Jacob Collins had good days at the plate. Tomorrow our boys will be battling Northwood again to close out the three game series. Good Luck Baseball. Boys Golf – Boy’s Golf – The team completed the season with a 6-4 record and in second place in league. Our team will compete in the CIF Team Divisional on May 18th at Talega Golf Club in San Clemente. Individual golfers competed this week at league finals in order to qualify for Individual CIF Regionals. William Tse, sophomore, was the only individual to qualify for Individual CIF. William’s two day total was 2-over par. He will play CIF on May 11 at Skylinks in Long Beach. Girls Lacrosse – The lady Trojans truly finished their season in style with a thrilling comeback win against Sage Hill on Friday, May 1st. After falling behind 6-4 at halftime, the team worked their way back into the game through an impressive display of defensive talent, midfield composure, and offensive firepower. With the help of Lily Huang in goal (who made 9 saves on 10 shots), the team allowed only one goal and netted seven to win the match 11-7! Kathy Guo and Ashlyn Wang had three goals apiece and Clarissa Wu, Andrea Echeverry, Sarah Verdegan, and Honia Mohtashami all scored as well. Kathy Guo finished the season as the third highest goal scorer in the Pacific Coast League, netting 67 times this season! Overall, the team finished 14-8, the best record the team has ever earned. Way to go, Girls Lacrosse! Softball – Softball girls played great against Beckman but came up short 5-1. Our offense highlighted Mia Maher who went 3-3 with 3 stolen bases and a bunt that turned into a Homerun! Great defense all around anchored by our outfield of Alyssa Hernandez, Kiana Boman and Peyton Mattson. Today we take on CDM for our GOW and Senior Day! Come out and support our girls! Boys Swim – After a collection of great performances at league prelims, the Varsity Trojan Boys Swim Team is in great position to win the Pacific Coast League Championship. Without relays, if the meet were to be scored as is right now the Trojan boys would be in first with 380 points, followed by CDM(270) and Northwood(268). Ken Takahashi is entering finals as the top seed in the 200 Free and 500 free. Daniel Tran is entering finals as the top seed in the 200IM and 100 Backstroke. Will Hofstadter is entering as the top seed in the 50 Free and 100 Free. The event where the team is showing its most depth is in the 100 Breaststroke. Judd Howard, Matt Wong, Matt Yong and Chris Havton all made the championship final(Top 8). An interesting fact, every boy that competed in prelims for University High School on Wednesday made it back to finals. We are the only school in our league that can say that. It is going to be an exciting day for Trojan Boys Swimming on Friday. GO TROJANS!!! Girls Swim – Our girls competed in the league prelims on Tuesday. We had several great performances and several of our girls will compete at league finals on Friday. 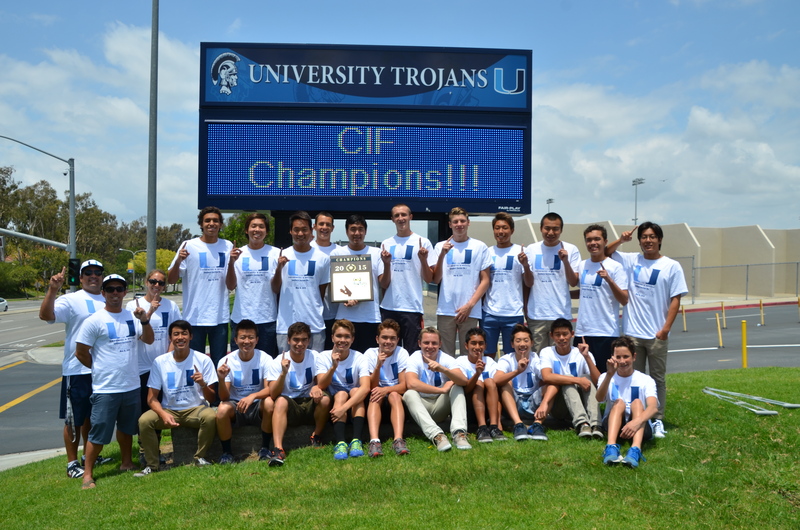 Our Uni boys won its 10 straight PCL boys’ tennis title. 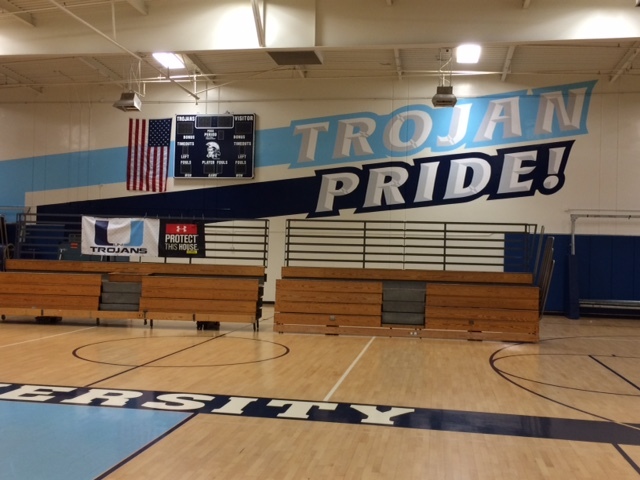 The win over Irvine Monday was the 88th straight PCL win for the Trojans spanning 10 years. This is a pretty incredible accomplishment considering how talented and stacked the PCL is from year to year. Our boys competed in the PCL individuals yesterday. Konrad Kozlowski has advanced to the semis. In doubles JT Joens and Tommy Wang made it to the semis along with Josh Piatos and Rohan Lageweg. The semifinals and finals will be played this afternoon at Woodbridge. Good Luck Boys tennis. Boys Track – Boys Track had some great performances and personal best on the season on Tuesday at league prelims. League Finals are this Friday here at Uni and hoping to have more personal best from our athletes. Girls Track – On Tuesday our girls track team competed in league prelims. UNI had a powerhouse performance with girls qualifying for finals in 14 events across all 3 levels. Our varsity qualifiers are Janine Bryant and Kyra Schmidt in the 1600, Paige Metayer and Carmel Lee in the 400, Daria Shkel, Mia Maher and Sofya Ogunseitan in the 100. Also, in the 800, Paige Metayer, Sarah Stern and Janine Bryant. Caroline Werth moves on in the 200 and will compete in the finals for triple and long jump. Melissa Lee and Lydia Haug will lead us in the throwing events, and are expected to have strong finishes. On Friday league finals will be here at UNI starting at 4:00 in the stadium. Come out and support our athletes! DODGEBALL – The UNI Dodgeball tournament has reached the finals. The finals will take place tomorrow at lunch in the gym. The winning student team will then play Team Teacher. Team members of Team Teacher are Mr. Pehrson, Mr. Budde, Mr. McCaffrey, Mr. Shrake, Mr. Gippen, and Mrs. McIntosh. Softball v CDM – 3:30 – This is their GOW – come our and support our girls!